We’re home! 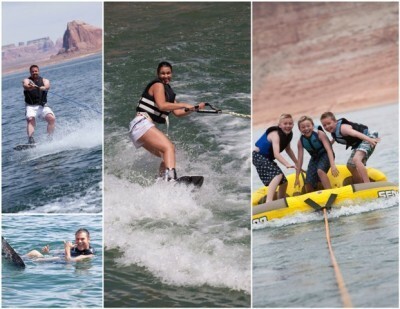 I mentioned I was off enjoying some R&R with my family, and we just got back from our annual trip to Lake Powell! It was particularly gorgeous and perfect this year—maybe because I was particularly exhausted and just needed some veg time. Seriously, I think I did less work than I’ve ever done; I really needed to just sit and stare into space for a few days and give myself some mental and physical catch-up time. Of course, I didn’t really stare into space for too long. There are always meals to prepare and grandchildren to play with and family to enjoy and a few small work-related tasks to complete. I’m not a real games person, but I did spend several hours playing cards with the grandkids (Speed with the older kids, and Go Fish with the younger ones). I also LOVED watching the older grandkids start venturing into some of the more adventurous water sports—without needing their dads or uncles to help them or spur them on. I can see how much fun this is going to be as our grandchildren get older! One of the reasons I love our Powell trip so much is that it’s so routine and predictable and low stress. We don’t wear make-up (the girls wanted to make sure that everyone knew that when they looked at the pictures), we don’t do our hair—I hardly even get dressed! Seriously, I packed two pairs of pajamas and two swimming suits this year. When I wasn’t in my jammies, I was in my swimming suit. Does it get better than that!? There’s nowhere to go (unless I have to boat out to find cell coverage to make a few phone calls), no decisions to make (we have the same menu every year), and no planning necessary. We have pretty much the same activities every year—water and jet skiing, bum busting, and playing in the sand, along with a movie at night—nothing to do but sit back and relax! So now I’ve had a week off and I’m back at it! I feel refreshed and rejuvenated and excited for the coming weeks and months, the new catalog, our Europe incentive trip, convention. . . . so many fun things in store. And I feel ready for it all—Lake Powell does that for me every time!